Marine management took a significant step forward, with the completion of plans under the Marine Plan Partnership (MaPP) for the North Pacific Coast; a co-led partnership between BC and 18 coastal Nations. 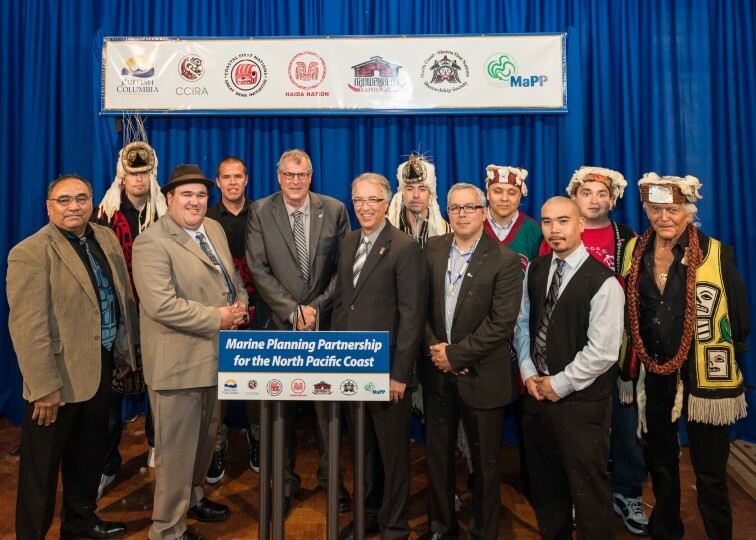 VICTORIA – Marine management took a significant step forward today, with the completion of plans under the Marine Plan Partnership (MaPP) for the North Pacific Coast; a co-led partnership between the Province of B.C. and 18 coastal Nations. Plan implementation, monitoring and amendment information which describes how we will move forward with the plans and how changes can be made. The Haida Gwaii plan area encompasses the archipelago of approximately 150 islands located 100 kilometres offshore, west of Spaḵsuut (the mouth of the Skeena River). The chain of islands extends roughly 250 kilometres from its southern tip to its northernmost point and includes the communities of G̱aaw (Old Massett), Masset, Gamadiis Llnagaay (Port Clements), Tll.aal Llnagaay (Tlell), Hlg̱aagilda (Skidegate), Daajing Giids (Queen Charlotte) and K’il Llnagaay (Sandspit). Boundaries for the Haida Gwaii planning area extent to around the middle of Hecate Strait and just south of Cape St. James (east/south), the international boundary with the United States (north), and the toe of the continental slope (west). The Gwaii Haanas National Park Preserve and Haida Heritage Site are included in the Haida Gwaii sub-region but spatial zoning for this area is being addressed through a separate planning process. The North Vancouver Island plan area is home to the Kwakw’ka’wakw First Nations and lies between northern Vancouver Island and B.C.’s mainland. There are many islands, inlets and fjords within the area, which is characterized by its natural beauty and biodiversity of species and ecosystems. Major water bodies include Queen Charlotte Sound, Queen Charlotte Strait, Johnstone Strait, Smith Inlet, Seymour Inlet, Knight Inlet and Bute Inlet The plan area includes the communities of Port Hardy, Port McNeill, Alert Bay, Sayward and Campbell River. Members of the Nanwakolas Council and partners in the MaPP initiative are: Mamalilikulla-Qwe’Qwa’Sot’Em, Tlowitsis, Da’nakda’xw-Awaetlatla, Gwa’sala-‘Nakwaxda’xw, Wei Wai Kum, Kwiakah and the K’ómoks First Nations.